We’re in the mid of September and Halloween is just a month away! It’s time to plan and create some fun Halloween decor with the help of embroidery designs. Explore these spooky Halloween-themed projects and patterns to get inspired! Halloween Kats are digitized by designer “EMS Designs.” These black kitties are so cute to sew up on any of your projects. You can use these embroidery designs for Halloween decorations. The set also features a free kitty sample for you. This spooky artwork is done by Diddybag. These designs are available in the hoop size of 4X4. 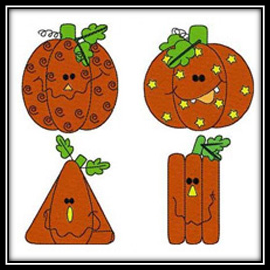 Pumpkins set is digitized by designer “Daffy Down Dilly.” These little pumpkins are quick to stitch and perfect for Halloween decorations. You can stitch up a pumpkin design to create Halloween treat bag. These cute designs are available in the hoop size of 4X4. 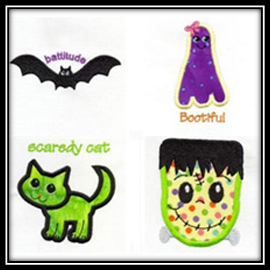 Halloween Cuties are digitized by designer “Too Cute Embroidery.” These designs are perfect to sew up on T-shirts, tote bags, goodie bags, and table runners, etc. It’s an exclusive work from Fairy Pixel Graphics. You can also apply some glitters to these embroidery machine designs for more fun. “Halloween Cuties” designs are available in two different hoop sizes i.e., 4X4 and 5X7. This set is digitized by designer “Kreations By Kara.” These creepy and spooky characters must be familiar to any individual obsessed with Halloween or horror. Imagine some of these designs stitched with glow-in-the-dark thread for that extra freaky effect. 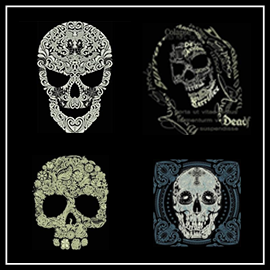 These skull designs are available in the hoop sizes of 5X7, 6X8 and 8×10. 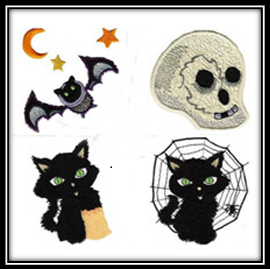 Halloween 3 set is digitized by designer “Sew-Sational Designs.” Sew Sational is spoiling us with not one but ten creepy Halloween embroidery designs. These patterns cover all your ghoulish needs. 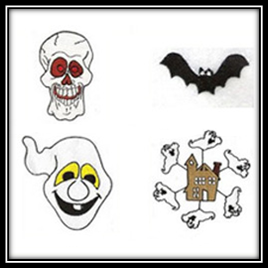 These scary embroidery patterns are available in the hoop size of 4X4. What are you waiting for? Tell us, which spooky design would you embroider first? For more designs, you can visit OPW Mall – where YOU are always #1.